If you've seen John Daly "strutting" his stuff around on the PGA Tour recently, then you've seen these pants before (or a similar pair). John's the poster boy for these obnoxious, Loudmouth designs. "Loud" being the key word here. These pants are a Van Halen show performed at the Daytona 500 with a Navy jet flyover. They remind me of those horrible pants the NFL players used to wear on the sidelines in the eighties. I remember Jim McMahon, the Bears QB, in a white headband sporting a pair of colorful noisy pants with elastic on the ankles. Maybe they'll catch on one day. Looks like JD is picking up where Jim left off. Perhaps he wears them to distract the competition. I'm surprised the PGA hasn't outlawed them yet. Now that I say that, I remember back in the day Johnny Miller and Jack Nicklaus sporting some pretty alternative styles that caught on. Of course, Long John will need to rise a few levels before he reaches their status. Let's pray he doesn't, lest we all will be wearing golf pant that looks like some kindergarteners got out of hand with the finger-paints (and then one of them vomited). I chose these Black Shagadelic pants to review because I liked them the most out of the many different designs that Loudmouth offers. (However, that's like saying if I had to lose one finger, I'd choose my pinky.) The pants are mostly cotton with 3% spandex (the material that screams "Rico Suave"), and they look comfortable. They have pretty flowers. 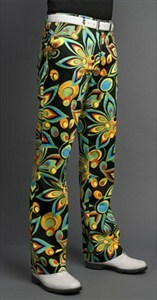 Also check out the Loudmouth Shorts. "Why?" you ask. Beats me. But why should I be the only one?